Although I have been a birder almost as far back as I can remember, chasing after rare birds has not been a big concern of mine. True, in the “old days,” news traveled much slower. One might hear about the appearance of a rare bird only if a friend happened upon it and called you, or if it made the newspapers. Reports at monthly bird club meetings were generally not very useful, as vagrant and rare birds, by their nature, tend to move on and disappear, perhaps within minutes or hours, if not a few days. No, I found it most enjoyable to bird the same couple of nearby patches of woodlands and wetlands. My own style of repeatedly visiting the same little “patches” produced its own rewards. Walking to the rhythm of the changing seasons, I delighted in the surprises that a change in weather or wind might produce. 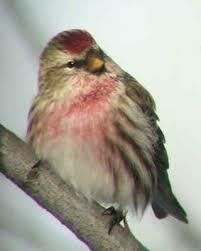 One wintry morning when I was 12 years old, while walking along a weed patch along the Passaic River in northwest Rutherford, I chanced upon a large flock of tiny streaked finches. They sported black chins and the unmistakable little red foreheads that belong only to redpolls, birds that I had seen only in field guides, and a species that sporadically visits the northern US from the Arctic. Excitedly, I raced home to phone an experienced birder, who simply dismissed my observation as the more common Purple Finches, birds with much different habitat, flocking and foraging patterns. I then called Lou Fink, a Scout Leader who authored a weekly nature column in the Rutherford Republican. Lou came right over and we drove down to the spot. He confirmed my observation, and having my name in his column the next week was a high point for me. People who read about the sighting then came out to look for the birds, but they were long gone. I had a polar opposite experience only a few months later. One weekend, Alan Nelson, another Scout leader, drove me and a few others from our troop to Troy Meadows for a generic nature walk. Here, a narrow boardwalk topped by two parallel 12 inch planks led about a mile out into a large marsh, under some power lines. Early in the walk, we came upon a raccoon that had been caught in a leg-hold trap that was chained to one of the pilings that supported the boardwalk. We covered the animal with a coat, lifted it up to the surface of the boardwalk, and restrained it as one of the scouts released the jaws of the trap. Once released, the animal amazed us by just standing there and looking at us, as if to say “Thank you.” It limped away slowly, repeatedly looking back at us over its shoulder. The remarkable image stays with me to this day. The highlight of the walk, at least for me, was yet to come. As the only enthusiastic birder in the group, I was tuned into the sounds of rails and bitterns as we made our way along the Troy Meadows boardwalk. Suddenly, a black heron-like bird flew up from the edge of a pond not more than 40 feet away. Unlike a heron, which folds its neck close to its body in flight, this bird flew with its neck extended, and its bill was very long and curved downward, sealing its identity as a Glossy Ibis (pictured). Even the non-birders agreed with me on the fine points of identification, as we compared our bird to pictures of other curve-billed birds such as curlews and whimbrels. I could not wait to report my find, as Glossy Ibis was indeed rare in northern New Jersey, and the last sighting was over ten years previously. The species had crossed over from Africa to South America only about 50 years before, and had since extended its range to the southern coastal US. The Hackensack Audubon Society met in Odd Fellows Hall that next week, and I persuaded my father to take me to the meeting. At one point the president asked attendees to report recent sightings. Excitedly, I raised my hand and was recognized. 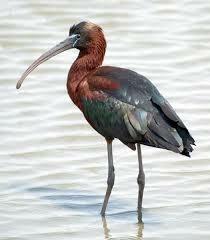 I carefully described my sighting of the Glossy Ibis to an incredulous audience of seasoned birders. One spoke out, asking me if I “put salt on its tail.” Another said that such an unusual sighting would have to be confirmed by an “experienced” member. I was devastated and embarrassed in front of my Dad, and swore I would have nothing to do with Audubon or its members ever again in my life! Interestingly, more Glossy Ibises were sighted later that year in Troy Meadows, and the species has since extended its range northward to become a regular breeder in the Northeastern US. Only a few “rare” birds may be counted among the nearly 600 species I have recorded in the Lower 48 and Canada. Thanks to the Internet, the birding community receives immediate notice of unusual sightings. I picked up two just because I happened to be in the areas when the birds were reported: Piratic Flycatcher in New Mexico (read my account here), and Northern Spindalis in Key West. We did seek out the third, the Northern Wheatear (see my Blog post and photo), an hour and a half away, in Everglades National Park.